The A.V. Club: What was the origin of this album? Kelly Hogan: Andy Kaulkin is the honcho at Anti- records, and I’ve known him for quite some time now through Neko. … I was at Amoeba Records. We were doing an in-store with Neko, and I was shopping in the jazz section and Andy walked up. “I gotta talk to you.” I thought I was late for bus call. I was like, “I’m sorry I’m late!” He said, “No, no, no. I want you to make a record for Anti-.” I thought I was being punked. I was like, “Really?” It all goes back to Andy. The label’s fantastic. It all goes back to the dude who’s running it, because Andy just loves music so much. The A.V. Club: So he had the concept of putting this band together and having all these people write songs for you? Kelly Hogan: Yeah. He suggested from the get-go that I should call in favors, because I’d sung with so many different people. Last February, he said, “What do you think about coming to L.A.? And we invest our money in the band?” And I was like, “Okay, who are you thinking?” And he said, “I’m thinking Booker T.” And I’m like, “Tell me more.” He mentioned James Gadson on drums, and I’d just seen that Still Bill documentary the night before, the Bill Withers documentary. It’s so great. James Gadson was Bill Withers’ drummer. Have you seen the footage of Bill Withers on “The Old Grey Whistle Test”? You’ve got to Google that, man. It pans over to James Gadson and he’s got this awesome Afro and this cool suit and a gold tooth and he’s just smiling this gorgeous “Everything is all right and it’s gonna be all right” smile. He still does that. That’s his playing face. You know how when most people are concentrating on playing, they look like they’re pooping? 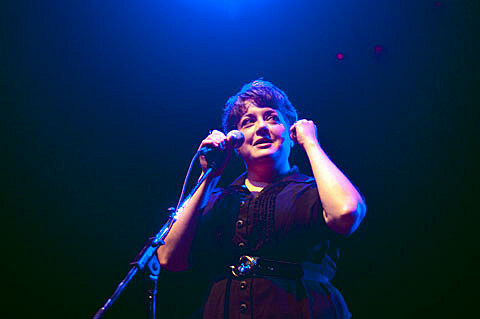 Kelly Hogan kicks off the 2012 edition of Downtown Sound on Monday night (5/28), at the Jay Pritzker Pavilion. Her new record and first since 2001’s Because it Feel Good, I Like to Keep Myself in Pain, is due out on June 5 via Anti-. Check out a short documentary on the album at the bottom of this post. Local H frontman Scott Lucas and his project the Married Men will act as main support on Monday night’s show. Their new album, Blood Half Moon, is due out on June 5 via The End Records. Download the album’s lead single “Blood Half Moons” at the top of this post. The band, who describe themselves as “country-ish alt-rock for people who like metal,” will also be doing some touring with Deer Tick next month, and are included on the bill of the band’s Chicago show at Metro on June 9. Tickets are still available. All dates for both Kelly Hogan and Scott Lucas are listed below.